An original letter of correspondence between Joshua Coffin Chase and Isleworth packinghouse superintendent Corbett Hutchinson. Topics discussed in the letter include the inadequate wrapping done by some of the fruit packers at Isleworth Grove and instructions to better improve packing. Original letter from Joshua Coffin Chase to Corbett Hutchinson, March 26, 1928: box 49, folder 20.91, Chase Collection (MS 14), Special and Area Studies Collections, George A. Smathers Libraries, University of Florida, Gainesville, Florida. 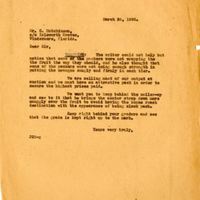 Digital reproduction of original letter from Joshua Coffin Chase to Corbett Hutchinson, March 26, 1928. Joshua Coffin Chase "Joshua Coffin Chase (1858-1948)." Florida Citrus Hall of Fame. Copyright 2012. http://floridacitrushalloffame.com/index.php/inductees/inductee-name/?ref_cID=89&bID=0&dd_asId=960. WRAPPING: The writer could not help but notice that some of the packers were not wrapping the fruit the way they should, and he also thought that some of the packers were not using enough strength in putting the oranges snugly and firmly in each tier. We are selling most of our output at auction and we must have an attractive pack in order to secure the highest prices paid. We want you to keep behind the nailer-up and see to it that he brings the center strap down more snuggly over the fruit to avoid having the boxes reach destination with the appearance of being slack pack. Keep right behind your graders and see that the grade is kept right up to the mark. Chase, Joshua Coffin. 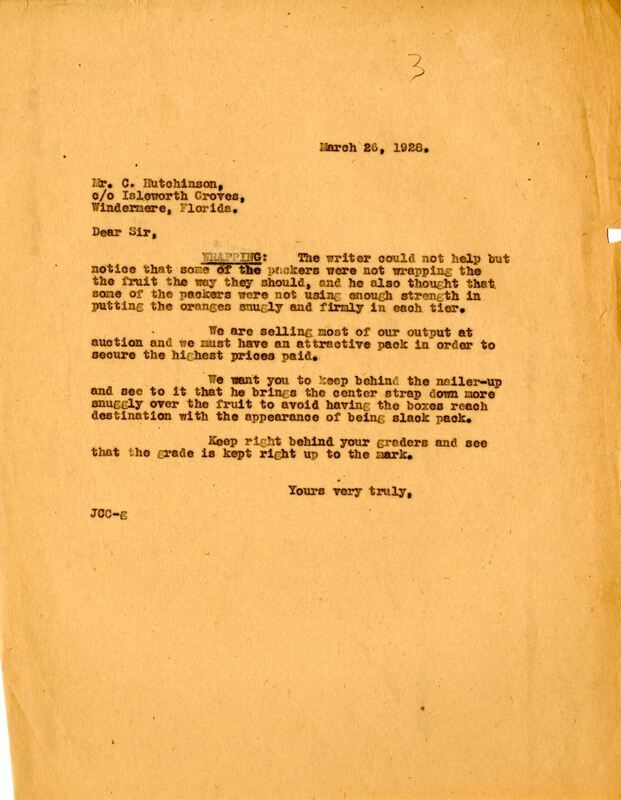 “Letter from Joshua Coffin Chase to Corbett Hutchinson (March 26, 1928).” RICHES of Central Florida accessed April 24, 2019, https://richesmi.cah.ucf.edu/omeka/items/show/2775.